There is nothing that beats the comfort of a good ol' fashioned peanut butter and jelly sandwich, is there? It's perhaps one of the easiest things in the world to prepare and it just tastes great. I cannot imagine never being able to have another in my life. But with so many food allergies, special dietary and healthy eating needs these days, that for many is reality. Thankfully, there are other options! Once Again Nut Butters is a great source for these. This employee owned company has been manufacturing nut butters, seed butters, and honeys since 1976. They offer a variety of products that are all gluten free certified, non GMO verified, certified organic, vegan, and kosher. They also follow Fair Trade and Sustainability standards for their farm partners, suppliers, and prices. Once Again Sunflower Seed Butter is made by roasting organically grown sunflower seeds. The seeds are milled smooth with sugar and salt added to create a delicious sunflower seed butter. Once Again Peanut Butter uses organic peanuts that are dry roasted and milled. Oil separation occurs naturally. To prevent, stir and refrigerate or freeze. Once Again Cashew Butter uses only the finest organically grown cashews to create a super creamy organic cashew butter. 5%-8% expeller-pressed organic sunflower oil is added to enhance the spreadability of this butter. First up, we had to stick with the classic- peanut butter. Now, if you've never used a natural peanut butter before, you might notice it looks a little bit different than your more mainstream peanut butters. Don't let the consistency and the look scare you away. It was every bit as delicious! We could not get enough. Paired with our favorite jelly on a PB&J or in a classic peanut butter cookie, we could not get enough! But for a little variety we had to give the others a chance too! All of them were fantastic, but our favorite had to be the almond butter. While it worked great as a substitute for peanut butter, we also loved it as dip. Pretzels, graham crackers, celery sticks... so many delicious combinations! We could not get enough. They make a great healthy snack, and allow you to mix it up from plain ol' classic peanut butter too. They also make a great lunchbox pick too. Many schools now have a no nut policy due to severe peanut allergies within the school. We don't want to be that parent that causes harm to another child, right? But for those eaters who love they peanut butter and little else, we can substitute with a sunflower seed butter that is school safe and tastes great! We've been trying to avoid any of the overprocessed products with vegetable and soy bean oil. These look like a great alternative. We love seed butters, but I've never heard of this brand. I'm so happy to know about them! We are huge nut butter fans in this house!! 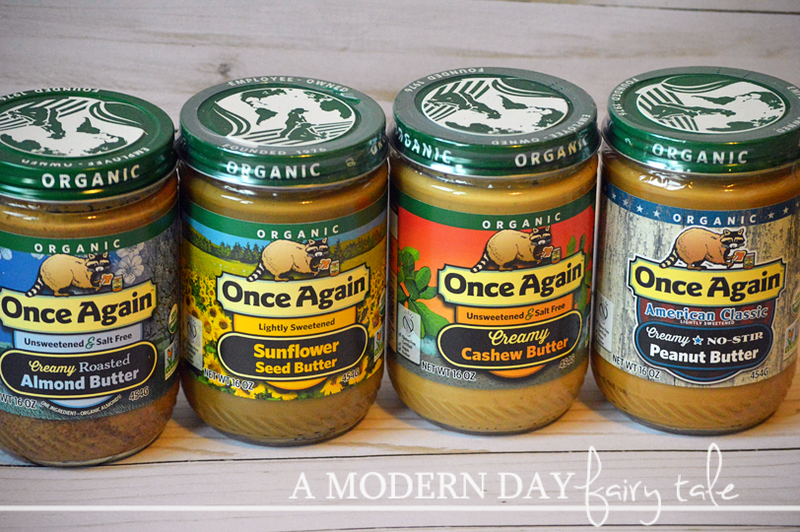 My son and I are known to eat it right from the jar ;) We will have to try this brand out! I would love to try the Cashew Butter. I haven't had that one before.